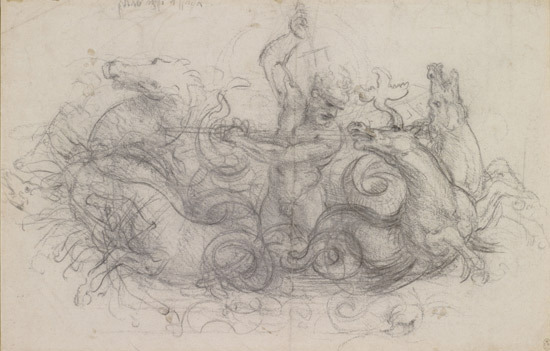 144 of Leonardo da Vinci's greatest drawings in the Royal Collection are currently on display in 12 simultaneous exhibitions of Leonardo da Vinci: A Life in Drawing across the UK. 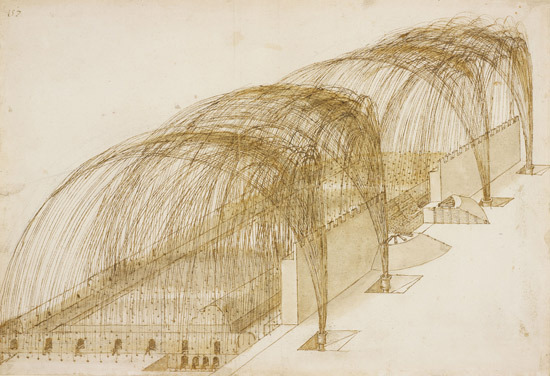 If you want to get to see the various exhibitions around the UK - or even all of them(!) - this is where you can see them. PLUS one of the images that can be seen at that location. 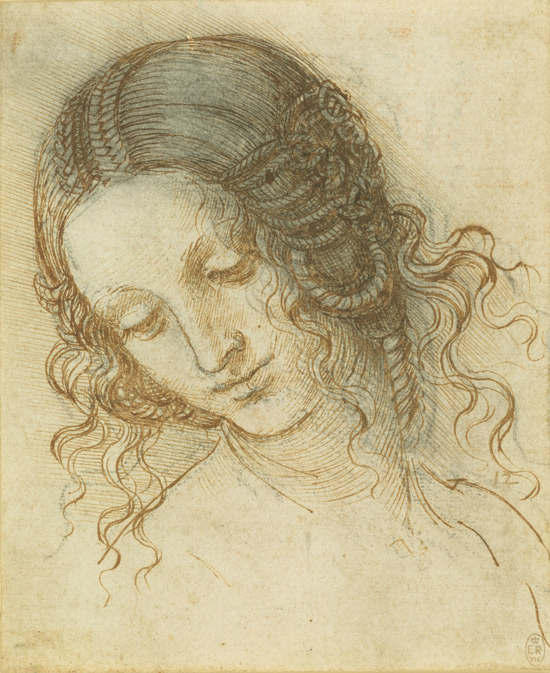 From 1 February - 6 May 2019, to mark the 500th anniversary of the death of Leonardo da Vinci, 144 of the Renaissance master's greatest drawings in the Royal Collection will go on display in 12 simultaneous exhibitions across the UK. This is a nationwide event. It rebuffs the notion that all the good art is only shown in London. 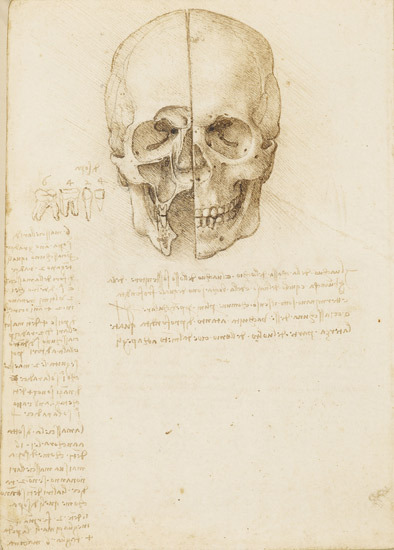 In fact, it will give da Vinci's drawings the widest-ever audience to celebrate the 500th anniversary of he death of da Vinci in 1519. 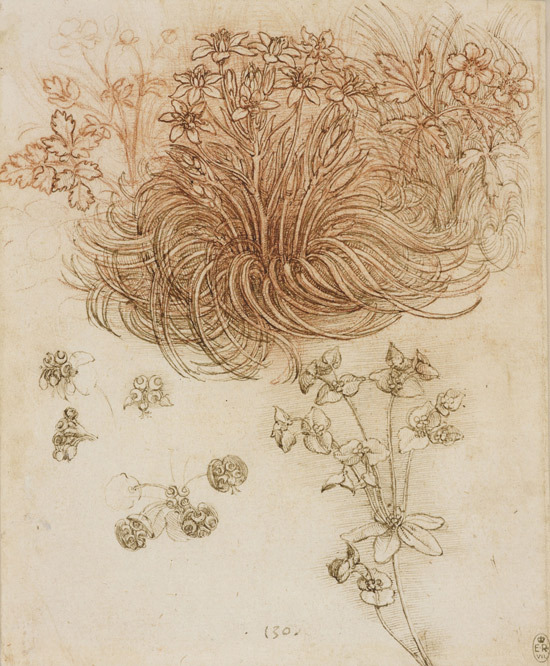 12 drawings selected to reflect the full range of Leonardo's interests – painting, sculpture, architecture, music, anatomy, engineering, cartography, geology and botany – will be shown at each venue in Belfast, Birmingham, Bristol, Cardiff, Derby, Glasgow, Leeds, Liverpool, Manchester, Sheffield, Southampton and Sunderland. Longer exhibitions will then be held at first the Queen's Gallery in London - followed by the Queen's Gallery in Edinburgh. 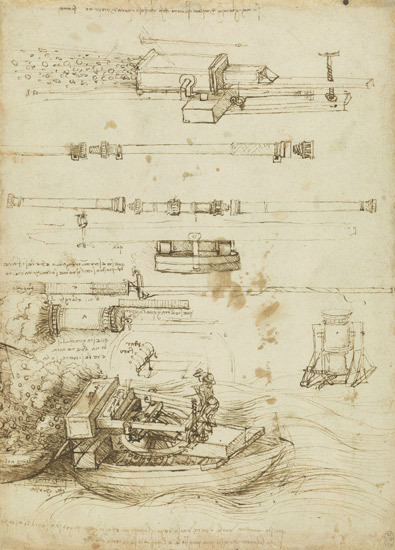 They also present new information about Leonardo's working practices and creative process, gathered through scientific research using a range of non-invasive techniques, including ultraviolet imaging, infrared reflectography and X-ray fluorescence. links to BBS news items - with the relevant gallery - which show more images and videos of the drawings on display. 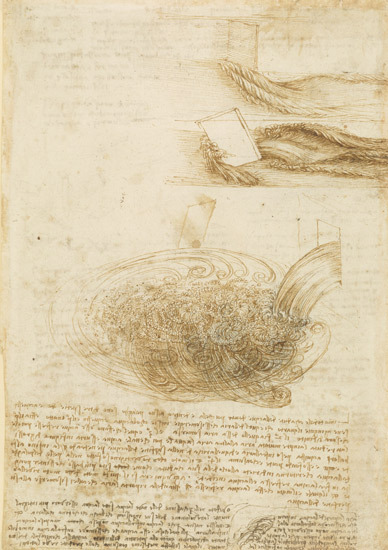 Leonardo was an accomplished map maker. 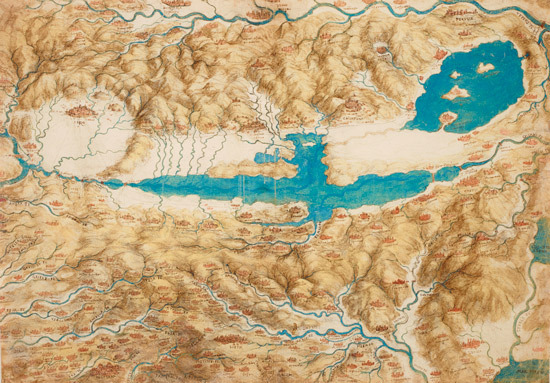 This map illustrates the Chiana valley in central Italy, with north to the left of the sheet. The river Tiber can be seen running along the top edge, the river Arno on the left and the city of Siena in the lower centre. Bristol are charging people for entry - while most other cities are showing their exhibitions for free. Bristolians may want to comment on this! 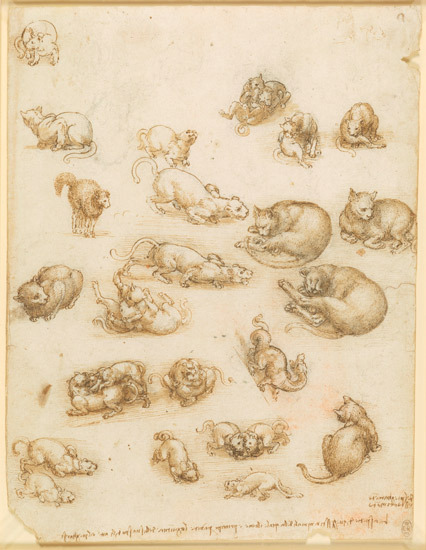 Anybody else got visions of da Vinci the cat lover - drawing next to a cat who likes to walk all over his drawings? To see the full line up of Leonardo events click here. Open during normal museum hours. These beautiful drawings will be on display in one of our smaller galleries and at busy times, including 11am–3pm weekdays and during weekends, you may be required to queue in order to see the works. Our programme of Inspired by Leonardo talks, workshops and events will be listed in the events section of our website soon. 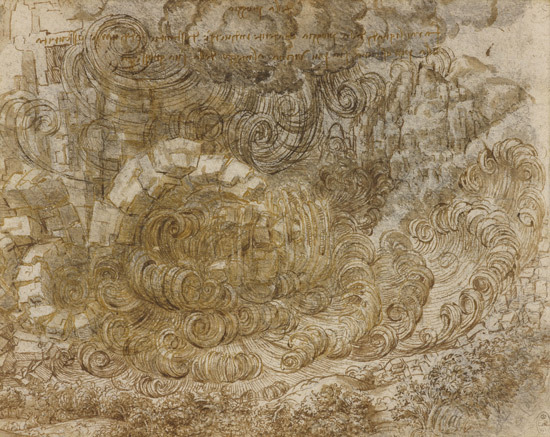 This will be the largest exhibition of Leonardo's work in over 65 years. You only get to experience this once in a lifetime. 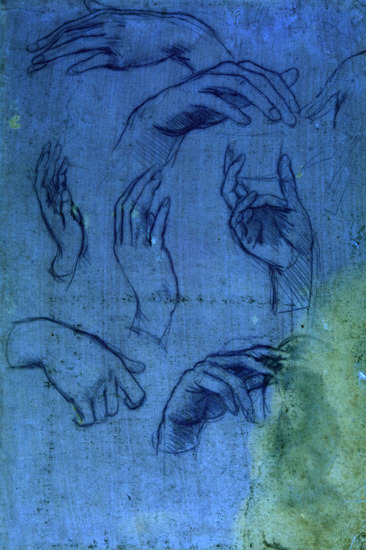 This is the image of a sheet of paper which apparently has no marks on it at all - until you put it under ultraviolet light at which point Leonardo's hand studies in metalpoint become apparent. The theory is that they he did these in copperpoint as this has a tendency to fade with age. 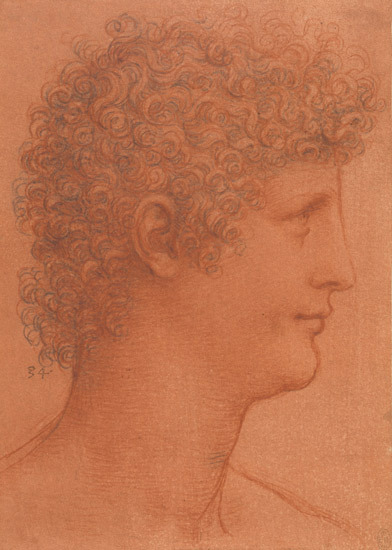 This will be the largest group of Leonardo's works ever shown in Scotland - very much a once in a lifetime event! Producing this blog post has been a very interesting exercise in which museums put the effort in and create proper websites for the exhibition and associated events programmes - and which simply "go through the motions". I hope the Royal Collection Trust will make a note of this for any future similar ventures to share works within the Royal Collection. I did an identical search query for all - and some came top of the pile immediately - and some I had to search for. The latter will probably never ever read this blog post! To those that are doing well - I know who you are and I'm hoping the RCT does too! 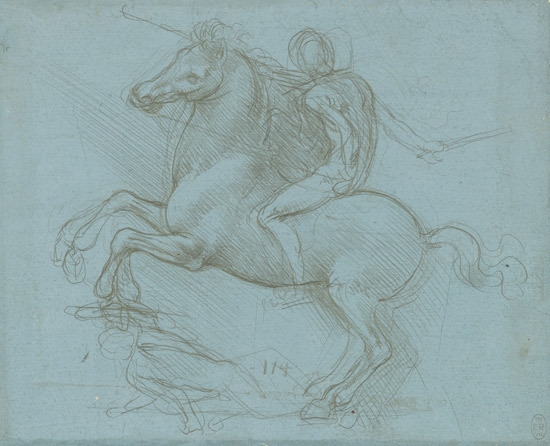 I've absolutely no objection to paying for the exhibition at the Queen's Gallery in London given I'll be able to see 200 drawings.